In just a few short years, the annual Winter Classic has become one of the NHL's showcase events. Today, the Philadelphia Flyers hosted the New York Rangers in an afternoon tilt held outdoors at Citizens Bank Park, home to the Philadelphia Phillies. 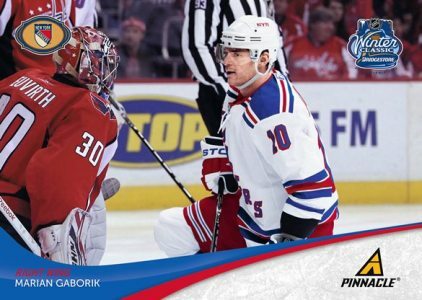 Panini was on-hand to give out packs of an exclusive set of cards made specifically for the event. Distributed in five-card packs, the 2011-12 Panini Winter Classic set has 20 cards. 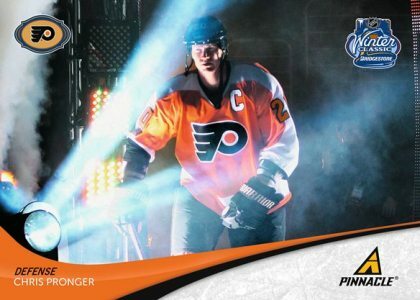 Both the Flyers and Rangers have five cards each, showcasing the top names on both squads. 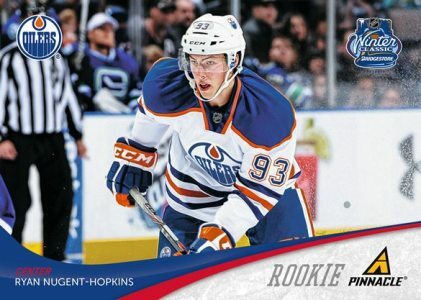 The checklist also has cards of previous Winter Classic games called "The Great Outdoors" and player cards of top stars like Alex Ovechkin and rookies of Ryan Nugent-Hopkins and Gabriel Landeskog. The cards feature excellent photography based on the 2011-12 Pinnacle design. The Great Outdoors subset comes from 2010-11 Playoff Contenders. Each of the 20 cards also has a one-of-one autographed version.